This recipe is easy, delicious, and paleo friendly. Just a reminder, we’re not super strict about dairy, and the pesto sauce has Parmesan cheese in it. It’s quick to make, and was a HUGE hit with my family! Heat 2-3 TBS olive oil in a skillet. Add 2-3 chicken breasts, cut in chunks. Cook until browned and no longer pink in the middle. While chicken is cooking, steam 1/2 head of cauliflower florets in microwave or on the stove. Add cauliflower to chicken. 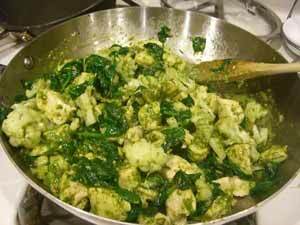 Add 1 1/2 cups baby spinach leaves and 1 package pesto sauce (I got mine at Wal-Mart, in the deli section). Heat through, just until spinach is wilted. Kim–I’ve never tried soaker hoses. Sorry! Have you used soaker hoses to irrigate, and if so, what kind is best?